A thoroughly revised and redesigned edition of this excellent title, previously published in 1995. The practical application of second law energy analysis and associated thermoeconomics is increasingly generating practical applications. 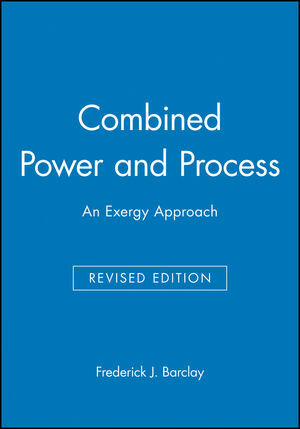 It is the aim of Combined Power and Process – An Exergy Approach to accelerate this process by providing selected examples of applications which demonstrate the fresh and altered sense of proportion obtainable from exergy methods. thermal processes, chemical reactions, electrolysis, or osmosis, to name but a few. Frederick J. Barclay is an independent consultant who is internationally respected for his work in the fields of the thermodynamics of power, desalination, fuel cells, and exergy aspects of combined heat and power. He has been involved in this area for many years and has vast experience of the subject in practice. He is the author of a number of highly regarded papers on this subject.